The new approach is described today in the journal Physical Review Letters in a paper by graduate student Yi-Xiang Liu, former graduate student Ashok Ajoy, and professor of nuclear science and engineering Paola Cappellaro. 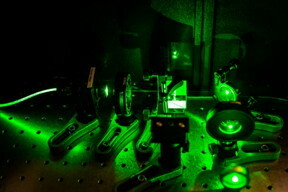 The technique builds on a platform already developed to probe magnetic fields with high precision, using tiny defects in diamond called nitrogen-vacancy (NV) centers. These defects consist of two adjacent places in the diamond’s orderly lattice of carbon atoms where carbon atoms are missing; one of them is replaced by a nitrogen atom, and the other is left empty. This leaves missing bonds in the structure, with electrons that are extremely sensitive to tiny variations in their environment, be they electrical, magnetic, or light-based. Previous uses of single NV centers to detect magnetic fields have been extremely precise but only capable of measuring those variations along a single dimension, aligned with the sensor axis. But for some applications, such as mapping out the connections between neurons by measuring the exact direction of each firing impulse, it would be useful to measure the sideways component of the magnetic field as well. Essentially, the new method solves that problem by using a secondary oscillator provided by the nitrogen atom’s nuclear spin. The sideways component of the field to be measured nudges the orientation of the secondary oscillator. By knocking it slightly off-axis, the sideways component induces a kind of wobble that appears as a periodic fluctuation of the field aligned with the sensor, thus turning that perpendicular component into a wave pattern superimposed on the primary, static magnetic field measurement. This can then be mathematically converted back to determine the magnitude of the sideways component. The method provides as much precision in this second dimension as in the first dimension, Liu explains, while still using a single sensor, thus retaining its nanoscale spatial resolution. In order to read out the results, the researchers use an optical confocal microscope that makes use of a special property of the NV centers: When exposed to green light, they emit a red glow, or fluorescence, whose intensity depends on their exact spin state. These NV centers can function as qubits, the quantum-computing equivalent of the bits used in ordinary computing. The needle of a simple magnetic compass tells the direction of a magnetic field, but not its strength. Some existing devices for measuring magnetic fields can do the opposite, measuring the field’s strength precisely along one direction, but they tell nothing about the overall orientation of that field. That directional information is what the new detector system can n provide. An interesting application for this technique would be to put the diamond NV centers in contact with a neuron, Liu says. When the cell fires its action potential to trigger another cell, the system should be able to detect not only the intensity of its signal, but also its direction, thus helping to map out the connections and see which cells are triggering which others. Similarly, in testing new magnetic materials that might be suitable for data storage or other applications, the new system should enable a detailed measurement of the magnitude and orientation of magnetic fields in the material. Unlike some other systems that require extremely low temperatures to operate, this new magnetic sensor system can work well at ordinary room temperature, Liu says, making it feasible to test biological samples without damaging them. The technology for this new approach is already available. “You can do it now, but you need to first take some time to calibrate the system,” Liu says. While this research was specifically aimed at measuring magnetic fields, the researchers say the same basic methodology could be used to measure other properties of molecules including rotation, pressure, electric fields, and other characteristics. The research was supported by the National Science Foundation and the U.S. Army Research Office.